Archival CDs or gold CDs are a good choice for the long-term storage of digital photos and other digital files. However, what is an archival CD? An archival CD is not one that lasts forever, but rather the longest lasting CD type disc that is available. When considering the storage of digital information on CDs it basically comes down to two types of formats – the CD-R or the CD-RW. The other CD format like the CD-audio disc or a compact disc that you purchase and contains software or other information on it, is a read-only format. You cannot use this type of disc to store information, since it already comes with the information already manufactured into it. Read-only CDs are primarily used for the wide distribution of information. For storing your own digital information, the remaining options are the CD-R and CD-RW formats. The erasable disc, otherwise known as the CD-RW disc, can be used to store digital photos or other digital files, but the disc is less secure because it can be erased. Also, an accelerated aging study has shown that the CD-RW does not show great stability because of the materials that are used to make this type of disc. Therefore, the CD-RWs are not considered archival CDs. The last option for storing information on CDs is the recordable CD format or the CD-R. Different types of materials, when compared to CD-RWs, are used to construct CD-Rs. Some of these materials have shown excellent stability in scientific tests and can be used to construct archival CDs. Recordable compact discs store information in a dye layer. The dye layer is either a cyanine dye (which is blue to light blue in color), an azo dye (which is also blue but generally a darker blue), and a phthalocyanine dye which is light green in color. The phthalocyanine dye is very stable and does not react to light, heat, or humidity and therefore is a good choice for a long lasting recordable compact disc. Another key layer in the CD-R structure is the metal layer, which reflects the reading laser light back to the player’s detector in order to register a signal after the dye layer has been read. Without this metal layer, the laser light would shine right through the disc and there would be no signal. In CD-Rs, the metal layer can either be silver based such as a silver alloy or gold. Silver can corrode and lead to an effect called laser rot. However, gold is inert and does not react and is the best choice for longevity. Archival CDs are CD-Rs that contain the stable light green phthalocyanine dye and the inert gold metal layer. The main manufacturer of this type of archival optical gold disc media is MAM (Mitsui Advanced Media) in the United States and Falcon also produces these discs. The manufacturer of this gold CD-R advertises that it will last 300 years. Whether this figure is accurate is not really important. 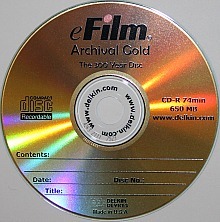 What is important is that this type of CD-R is the most stable CD-R. Pictured below is an example of an archival gold CD-R by Delkin eFilm. This company, at one point, would buy discs from MAM and label them as their own. This is not an unusual practice in the optical disc manufacturing industry. A negative factor about this type of disc (and any CD for that matter) is the very low storage capacity. Today's digital files are often very large and many compact discs would be required to store a project or assorted information. A second negative factor for the archival CD is the cost. 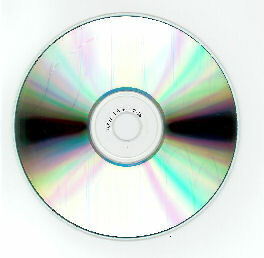 The price of a gold CD-R can be up to four times the cost of a regular CD-R. This makes it extremely expensive to store large amounts of information. These discs are better suited for storing only a small amount of files that are considered valuable. Another type of disc that is available on the market is from Verbatim and it is being advertised as an archival CD. This type of disc uses the stable phthalocyanine dye but has two metal layers – a silver metal layer to reflect the laser light and a gold metal layer as a protective barrier for the more reactive silver metal. Some research has been performed to evaluate the stability of this type of disc versus the MAM gold CDs. It was determined that the stability was similar to the stability of the gold CD-R. However, the aging test was performed in a clean environment and it is not known how stable the disc would be in a polluted environment. The gold CD-R would not suffer in such environments and therefore, it is rated as more stable than the silver/gold metal layer combination disc. Below is a list of CD-R stability from highest stability to lowest in order to clarify the information presented above. The archival CDs can be identified by their gold appearance when viewing the base of the disc as shown below. CD-Rs with the phthalocyanine dye (the dye began to be widely used in 2000) and silver metal layer appear silver to light green in color, when viewed from the base side, as shown below. CD-Rs with azo dye were introduced in 1996. 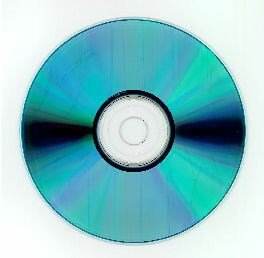 The cyanine dye discs, which were the first type of CD-Rs and are the discs the recordable CD specifications were built upon, were introduced in 1990. Both appear as a shade of blue as shown below. Even if an archival CD is used to store digital photos and other digital files, it is good practice to always have a second copy of the information on a different type of storage media. These chemically stable discs can still be lost, stolen, or physically damaged, all of which would lead to the loss of information. Another point to note is that eventually the CD technology will become obsolete. Therefore, regardless how long archival CDs last, eventually the information on them will have to be transferred to another format if the information is to remain readable well into the future.